The Second Epistle to Timothy is one of the three Pastoral Epistles attributed to Saint Paul and is part of the canonical New Testament. Traditionally, it is believed to have been written sometime in 67 C.E. during Paul's Roman imprisonment, near the end of his life. However, many contemporary scholars believe that it—like 1 Timothy and Titus, the other Pastoral Epistles—was written in Paul's name by another writer sometime after Paul's death. In his letter, the writer urges Timothy to not have a "spirit of timidity" or to be "ashamed to testify about our Lord" (1:7-8). He also entreats Timothy to come to him before winter, because "the time of my departure is at hand" (4:6). He exhorts his reader to all diligence and steadfastness in the face of false teachings, to patience under persecution (1:6–15), and to a faithful discharge of all the duties of his office (4:1–5), presumably that of bishop. The letter is particularly important for its insistence (3:16) that "all scripture is 'God breathed'," affirming that the Hebrew Bible is inspired by the same God as the Christian scriptures. In the mid-second century C.E., this was a key issue in the battle between the orthodox church and Marcionism, which taught the "Old Testament" should be rejected by Christians. Rembrandt's Saint Paul. If 2 Timothy was indeed written by Paul, it would have been composed near the end of the Apostle's life. The situation described in these epistles does not match Paul's career as set for in the Book of Acts. Church organization does not confirm with what Paul describes in his other epistles but does match that of the later church. The heresies against which the letters fight—apparently, in the cast of 2 Timothy, Marcionism and Gnosticism—arose after Paul's death. Differences in style and vocabulary are pronounced. The formality of the letters to Timothy seem inappropriate, considering the close personal relationship he enjoyed with Timothy. Pseudonymous literature was common in the ancient world, and was usually created in the spirit of honoring the person in whose name it was written. Thus, if these letters were indeed written by someone other than Paul, they should not be considered as dishonest forgeries, but sincere attempts to invoke the name and spirit of Paul to bring the message he would have brought to a later period. An analogy in modern times is the tradition of "channeled" writings from a person no longer living. The purpose of 2 Timothy depends somewhat on whether one believes it was written by Paul or someone else. If Paul is indeed the author, then the purpose is fairly straightforward: to encourage Timothy—Paul's own spiritual son, loyal companion, and now a bishop—to maintain and strengthen his faith during a time of both persecution and confusion, due to the presence of heretical teachers in his congregation. In this case the letter also has a personal purpose: to request Timothy to join Paul, who has been deserted in his hour of need by several of his closest associates, and even to bring some personal items such as a cloak and writing materials. If it is not by Paul, then 2 Timothy's purpose is more general: to encourage Christians (the collective "Timothy" in this case) to endure through persecution and stand strong against heresy. In the latter case, the heresies in question are also more identifiable than if the letter is authentically Pauline. One of them is probably Marcionism, which taught that the Jewish scriptures were not inspired by the loving "Heavenly Father" of Jesus, but by a lesser, wrathful deity. "Paul" thus counters the Marcionite view that the Old Testament should be rejected by Christians, stating instead that "all Scripture is God-breathed," referring especially to the scriptures of Timothy's own background, being raised by a Jewish mother and grandmother. Another targeted heresy is apparently Gnosticism, which by the second century had developed a sophisticated cosmology denigrated here as "myths" (4:4). Many Gnostics also denied the physical resurrection of Jesus, affirming that what matters is not the body but the enlightenment of the spirit. Thus "Paul" decries the doctrine of Hymenaeus and Philetus, who have "wandered away from the truth" and taught that "the resurrection has already taken place." Both Gnosticism and Marcionism may also be in the author's mind when he speaks of his own message of preaching Jesus as "raised from the dead, descended from David," thus affirming both the resurrection and the continuity of Christianity with the Old Testament tradition. In terms of date, if 2 Timothy is by Paul, then it would be written very late in the Apostle's life, probably around 67 C.E. Some scholars take the view that 2 Timothy was written prior to 1Timothy. If Marcionism is one of the writer's targets, then it could not have been written earlier than the middle of the second century C.E. However, a number of critical scholars believe the writer, though someone other than Paul, was writing against earlier heresies, such as an early form of Gnosticism and a pre-Marcionite version of the doctrine which considered the Old Testament to be invalid. 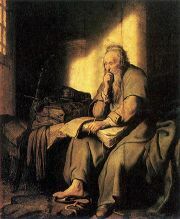 Writing from prison in Rome, Paul is abandoned by most of his supporters and requests Timothy to come to him, bringing needed supplies, including a cloak and writing implements. The Second Epistle to Timothy left a lasting impact of Christian tradition. One of its most famous phrases—"All scripture is given by inspiration of God, and is profitable for doctrine, for reproof, for correction, for instruction in righteousness" (2 Tim. 3:16—NIV)—is important for two reasons. In the early church, it strengthened the orthodox view that the Jewish scripture was indeed inspired by God and could be used with authority by Christian teachers. In modern times, it has been used to justify the doctrine of the verbal inspiration of scripture. In this case, even though the New Testament canon had not yet been compiled at the time of its writing, the verse is interpreted to refer to the Christian scriptures as well as the Old Testament. 2 Timothy also provides the one reference in Paul's purported letters which mentions Paul's companion Mark, who by later tradition was the author of the Gospel which today bears his name. (Mark is mentioned several times in the Book of Acts, but nowhere else in Paul's letter.) In a similar vein, 2 Timothy is one of three places in the entire New Testament—the others being Colossians 4:14 and Philemon 1:24—which mentions Paul's companion Luke, traditionally believed to have written both the Gospel of Luke and the Book of Acts. ↑ The reference to Timothy's position of singular authority in his congregation and the sacrament of laying on of hands is one reason that some scholars believe the letter to be late, since the bishop's office is not believed to have been formalized until the second century. 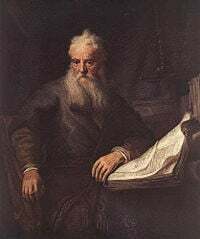 History of "Second Epistle to Timothy"
This page was last modified on 25 September 2018, at 21:51.